A number of substantial changes are to be made to Council Regulation (EEC) No 881/92 of 26 March 1992 on access to the market in the carriage of goods by road within the Community to or from the territory of a Member State or passing across the territory of one or more Member States (3), to Council Regulation (EEC) No 3118/93 of 25 October 1993 laying down the conditions under which non-resident carriers may operate national road haulage services within a Member State (4), and to Directive 2006/94/EC of the European Parliament and of the Council of 12 December 2006 on the establishment of common rules for certain types of carriage of goods by road (5). In the interests of clarity and simplification, those legal acts should be recast and incorporated into one single regulation. The establishment of a common transport policy entails, inter alia, laying down common rules applicable to access to the market in the international carriage of goods by road within the territory of the Community, as well as laying down the conditions under which non-resident hauliers may operate transport services within a Member State. Those rules must be laid down in such a way as to contribute to the smooth operation of the internal transport market. To ensure a coherent framework for international road haulage throughout the Community, this Regulation should apply to all international carriage on Community territory. Carriage from Member States to third countries is still largely covered by bilateral agreements between the Member States and those third countries. Therefore, this Regulation should not apply to that part of the journey within the territory of the Member State of loading or unloading as long as the necessary agreements between the Community and the third countries concerned have not been concluded. It should, however, apply to the territory of a Member State crossed in transit. The establishment of a common transport policy implies the removal of all restrictions against the person providing transport services on the grounds of nationality or the fact that he is established in a different Member State from the one in which the services are to be provided. In order to achieve this smoothly and flexibly, provision should be made for a transitional cabotage regime as long as harmonisation of the road haulage market has not yet been completed. The gradual completion of the single European market should lead to the elimination of restrictions on access to the domestic markets of Member States. Nevertheless, this should take into account the effectiveness of controls and the evolution of employment conditions in the profession, the harmonisation of the rules in the fields of, inter alia, enforcement and road user charges, and social and safety legislation. The Commission should closely monitor the market situation as well as the harmonisation mentioned above and propose, if appropriate, the further opening of domestic road transport markets, including cabotage. Under Directive 2006/94/EC, a certain number of types of carriage are exempt from Community authorisation and from any other carriage authorisation. Within the framework of the organisation of the market provided for by this Regulation, a system of exemption from the Community licence and from any other carriage authorisation should be maintained for some of those types of carriage, because of their special nature. Under Directive 2006/94/EC, the carriage of goods with vehicles of a maximum laden weight of between 3,5 tonnes and 6 tonnes was exempt from the requirement for a Community licence. Community rules in the field of road transport of goods, however, apply in general to vehicles with a maximum laden mass of more than 3,5 tonnes. Thus, the provisions of this Regulation should be aligned with the general scope of application of Community road transport rules and should only provide for an exemption for vehicles with a maximum laden mass of up to 3,5 tonnes. The international carriage of goods by road should be conditional on the possession of a Community licence. Hauliers should be required to carry a certified true copy of the Community licence aboard each of their vehicles in order to facilitate effective controls by enforcement authorities, especially those outside the Member State in which the haulier is established. To this end, it is necessary to lay down more detailed specifications as regards the layout and other features of the Community licence and the certified copies. Roadside checks should be carried out without direct or indirect discrimination on grounds of the nationality of the road transport operator or the country of establishment of the road transport operator or of registration of the vehicle. The conditions governing the issue and withdrawal of Community licences and the types of carriage to which they apply, their periods of validity and the detailed rules for their use should be determined. A driver attestation should also be established in order to allow Member States to check effectively whether drivers from third countries are lawfully employed or at the disposal of the haulier responsible for a given transport operation. Hauliers who are holders of Community licences provided for in this Regulation and hauliers authorised to operate certain categories of international haulage service should be permitted to carry out national transport services within a Member State on a temporary basis in conformity with this Regulation, without having a registered office or other establishment therein. When such cabotage operations are performed, they should be subject to Community legislation such as Regulation (EC) No 561/2006 of the European Parliament and of the Council of 15 March 2006 on the harmonisation of certain social legislation relating to road transport (6) and to national law in force in specified areas in the host Member State. Provisions should be adopted to allow action to be taken in the event of serious disturbance of the transport markets affected. For that purpose it is necessary to introduce a suitable decision-making procedure and for the required statistical data to be collected. Without prejudice to the provisions of the Treaty on the right of establishment, cabotage operations consist of the provision of services by hauliers within a Member State in which they are not established and should not be prohibited as long as they are not carried out in a way that creates a permanent or continuous activity within that Member State. To assist the enforcement of this requirement, the frequency of cabotage operations and the period in which they can be performed should be more clearly defined. In the past, such national transport services were permitted on a temporary basis. In practice, it has been difficult to ascertain which services are permitted. Clear and easily enforceable rules are thus needed. 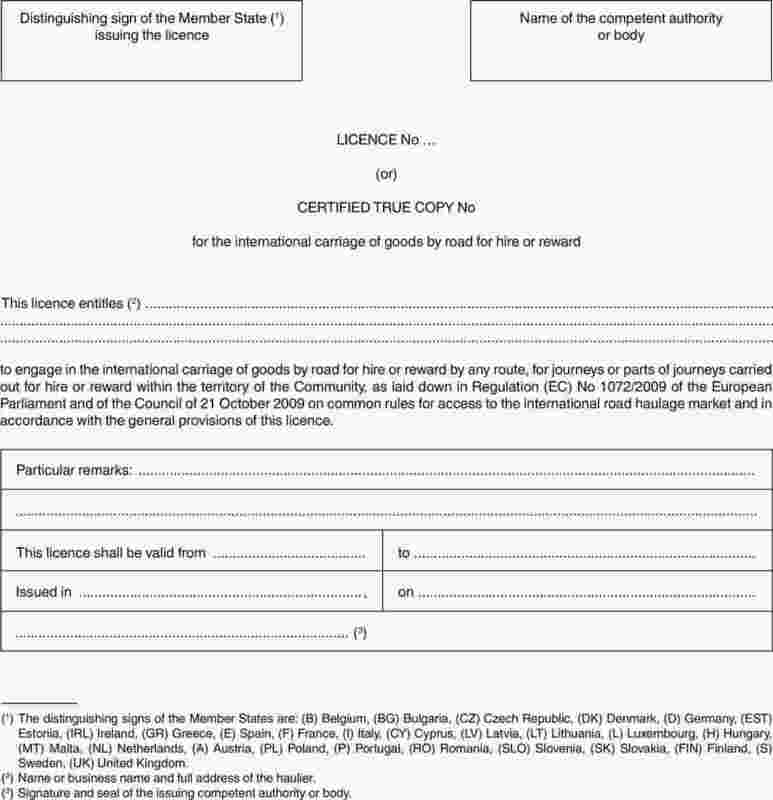 This Regulation is without prejudice to the provisions concerning the incoming or outgoing carriage of goods by road as one leg of a combined transport journey as laid down in Council Directive 92/106/EEC of 7 December 1992 on the establishment of common rules for certain types of combined transport of goods between Member States (7). National journeys by road within a host Member State which are not part of a combined transport operation as laid down in Directive 92/106/EEC fall within the definition of cabotage operations and should accordingly be subject to the requirements of this Regulation. The provisions of Directive 96/71/EC of the European Parliament and of the Council of 16 December 1996 concerning the posting of workers in the framework of the provision of services (8) apply to transport undertakings performing a cabotage operation. In order to perform efficient controls of cabotage operations, the enforcement authorities of the host Member States should, at least, have access to data from consignment notes and from recording equipment, in accordance with Council Regulation (EEC) No 3821/85 of 20 December 1985 on recording equipment in road transport (9). Member States should grant each other mutual assistance with a view to the sound application of this Regulation. Administrative formalities should be reduced as far as possible without abandoning the controls and penalties that guarantee the correct application and effective enforcement of this Regulation. To this end, the existing rules on the withdrawal of the Community licence should be clarified and strengthened. The current rules should be adapted to allow the effective sanctioning of serious infringements committed in a host Member State. Penalties should be non-discriminatory and proportionate to the seriousness of the infringements. It should be possible to lodge an appeal in respect of any penalties imposed. Member States should enter in their national electronic register of road transport undertakings all serious infringements committed by hauliers which have led to the imposition of a penalty. In order to facilitate and strengthen the exchange of information between national authorities, Member States should exchange the relevant information through the national contact points set up pursuant to Regulation (EC) No 1071/2009 of the European Parliament and of the Council of 21 October 2009 establishing common rules concerning the conditions to be complied with to pursue the occupation of road transport operator (10). In particular, the Commission should be empowered to adapt Annexes I, II and III to this Regulation to technical progress. Since those measures are of general scope and are designed to amend non-essential elements of this Regulation, they must be adopted in accordance with the regulatory procedure with scrutiny provided for in Article 5a of Decision 1999/468/EC. Member States should take the necessary measures to implement this Regulation, in particular as regards effective, proportionate and dissuasive penalties. 2. In the event of carriage from a Member State to a third country and vice versa, this Regulation shall apply to the part of the journey on the territory of any Member State crossed in transit. It shall not apply to that part of the journey on the territory of the Member State of loading or unloading, as long as the necessary agreement between the Community and the third country concerned has not been concluded. provisions relating to the carriage from a Member State to a third country and vice versa included in bilateral agreements concluded between Member States which, under either bilateral authorisations or liberalisation arrangements, allow loading and unloading in a Member State by hauliers not established in that Member State. 4. This Regulation shall apply to the national carriage of goods by road undertaken on a temporary basis by a non-resident haulier as provided for in Chapter III. carriage of medicinal products, appliances, equipment and other articles required for medical care in emergency relief, in particular for natural disasters. Point (d)(iv) of the first subparagraph shall not apply to the use of a replacement vehicle during a short breakdown of the vehicle normally used. 6. The provisions of paragraph 5 shall not affect the conditions under which a Member State authorises its nationals to engage in the activities referred to in that paragraph. ‘serious infringement of Community road transport legislation’ means an infringement which may lead to the loss of good repute in accordance with Article 6(1) and (2) of Regulation (EC) No 1071/2009 and/or to the temporary or permanent withdrawal of a Community licence. International carriage shall be carried out subject to possession of a Community licence and, if the driver is a national of a third country, in conjunction with a driver attestation. is entitled in the Member State of establishment, in accordance with Community legislation and the national legislation of that Member State concerning admission to the occupation of road haulage operator, to carry out the international carriage of goods by road. 2. The Community licence shall be issued by the competent authorities of the Member State of establishment for renewable periods of up to 10 years. Community licences and certified copies issued before the date of application of this Regulation shall remain valid until their date of expiry. The Commission shall adapt the period of validity of the Community licence to technical progress, in particular the national electronic registers of road transport undertakings as provided for in Article 16 of Regulation (EC) No 1071/2009. Those measures, designed to amend non-essential elements of this Regulation, shall be adopted in accordance with the regulatory procedure with scrutiny referred to in Article 15(2). 3. The Member State of establishment shall issue the holder with the original of the Community licence, which shall be kept by the haulier, and the number of certified true copies corresponding to the number of vehicles at the disposal of the holder of the Community licence, whether those vehicles are wholly owned or, for example, held under a hire purchase, hire or leasing contract. 4. The Community licence and the certified true copies shall correspond to the model set out in Annex II, which also lays down the conditions governing its use. They shall contain at least two of the security features listed in Annex I. The Commission shall adapt Annexes I and II to technical progress. Those measures, designed to amend non-essential elements of this Regulation, shall be adopted in accordance with the regulatory procedure with scrutiny referred to in Article 15(2). 5. The Community licence and the certified true copies thereof shall bear the seal of the issuing authority as well as a signature and a serial number. The serial numbers of the Community licence and of the certified true copies shall be recorded in the national electronic register of road transport undertakings as part of the data relating to the haulier. 6. The Community licence shall be issued in the name of the haulier and shall be non-transferable. A certified true copy of the Community licence shall be kept in each of the haulier’s vehicles and shall be presented at the request of any authorised inspecting officer. In the case of a coupled combination of vehicles, the certified true copy shall accompany the motor vehicle. It shall cover the coupled combination of vehicles even where the trailer or semi-trailer is not registered or authorised to use the roads in the name of the licence holder or where it is registered or authorised to use the roads in another State. by collective agreements, in accordance with the rules applicable in that Member State. 2. 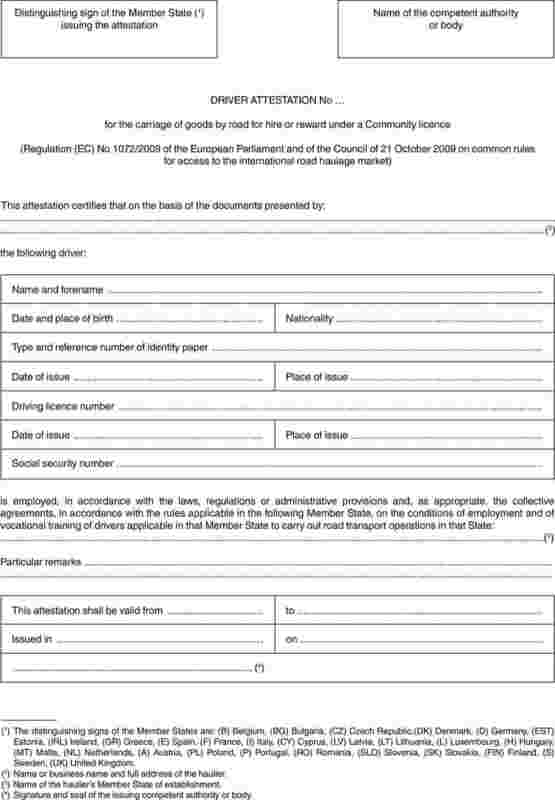 The driver attestation shall be issued by the competent authorities of the Member State of establishment of the haulier, at the request of the holder of the Community licence, for each driver who is neither a national of a Member State nor a long-term resident within the meaning of Directive 2003/109/EC whom that haulier lawfully employs, or for each driver who is neither a national of a Member State nor a long-term resident within the meaning of that Directive and who is put at the disposal of the haulier. Each driver attestation shall certify that the driver named therein is employed in accordance with the conditions laid down in paragraph 1. 3. The driver attestation shall correspond to the model set out in Annex III. It shall contain at least two of the security features listed in Annex I. 4. The Commission shall adapt Annex III to technical progress. Those measures, designed to amend non-essential elements of this Regulation, shall be adopted in accordance with the regulatory procedure with scrutiny referred to in Article 15(2). 5. The driver attestation shall bear the seal of the issuing authority as well as a signature and a serial number. The serial number of the driver attestation may be recorded in the national electronic register of road transport undertakings as part of the data relating to the haulier who puts it at the disposal of the driver designated therein. 6. The driver attestation shall belong to the haulier, who puts it at the disposal of the driver designated therein when that driver drives a vehicle using a Community licence issued to that haulier. A certified true copy of the driver attestation issued by the competent authorities of the haulier’s Member State of establishment shall be kept at the haulier’s premises. The driver attestation shall be presented at the request of any authorised inspecting officer. 7. A driver attestation shall be issued for a period to be determined by the issuing Member State, subject to a maximum validity of 5 years. Driver attestations issued before the date of application of this Regulation shall remain valid until their date of expiry. The driver attestation shall be valid only as long as the conditions under which it was issued are satisfied. Member States shall take appropriate measures to ensure that if those conditions are no longer met, the haulier returns the attestation immediately to the issuing authorities. 1. Whenever an application for a Community licence or an application for renewal of a Community licence in accordance with Article 4(2) is lodged, the competent authorities of the Member State of establishment shall verify whether the haulier satisfies or continues to satisfy the conditions laid down in Article 4(1). 2. The competent authorities of the Member State of establishment shall regularly verify, by carrying out checks each year covering at least 20 % of the valid driver attestations issued in that Member State, whether the conditions, referred to in Article 5(1), under which a driver attestation has been issued are still satisfied. 1. If the conditions laid down in Article 4(1) or those referred to in Article 5(1) are not satisfied, the competent authorities of the Member State of establishment shall reject an application for the issue or renewal of a Community licence or the issue of a driver attestation, by means of a reasoned decision. has supplied incorrect information in relation to an application for a Community licence or for a driver attestation. 1. Any haulier for hire or reward who is a holder of a Community licence and whose driver, if he is a national of a third country, holds a driver attestation, shall be entitled, under the conditions laid down in this Chapter, to carry out cabotage operations. 2. Once the goods carried in the course of an incoming international carriage have been delivered, hauliers referred to in paragraph 1 shall be permitted to carry out, with the same vehicle, or, in the case of a coupled combination, the motor vehicle of that same vehicle, up to three cabotage operations following the international carriage from another Member State or from a third country to the host Member State. The last unloading in the course of a cabotage operation before leaving the host Member State shall take place within 7 days from the last unloading in the host Member State in the course of the incoming international carriage. Within the time limit referred to in the first subparagraph, hauliers may carry out some or all of the cabotage operations permitted under that subparagraph in any Member State under the condition that they are limited to one cabotage operation per Member State within 3 days of the unladen entry into the territory of that Member State. 3. National road haulage services carried out in the host Member State by a non-resident haulier shall only be deemed to conform with this Regulation if the haulier can produce clear evidence of the incoming international carriage and of each consecutive cabotage operation carried out. the number plates of the motor vehicle and trailer. 4. No additional document shall be required in order to prove that the conditions laid down in this Article have been met. 5. Any haulier entitled in the Member State of establishment, in accordance with that Member State’s legislation, to carry out the road haulage operations for hire or reward specified in Article 1(5)(a), (b) and (c) shall be permitted, under the conditions set out in this Chapter, to carry out, as the case may be, cabotage operations of the same kind or cabotage operations with vehicles in the same category. 6. Permission to carry out cabotage operations, within the framework of the types of carriage referred to in Article 1(5)(d) and (e), shall be unrestricted. the value added tax (VAT) on transport services. The weights and dimensions referred to in point (b) of the first subparagraph may, where appropriate, exceed those applicable in the haulier’s Member State of establishment, but they may under no circumstances exceed the limits set by the host Member State for national traffic or the technical characteristics mentioned in the proofs referred to in Article 6(1) of Council Directive 96/53/EC of 25 July 1996 laying down for certain road vehicles circulating within the Community the maximum authorised dimensions in national and international traffic and the maximum authorised weights in international traffic (14). 2. The laws, regulations and administrative provisions referred to in paragraph 1 shall be applied to non-resident hauliers under the same conditions as those imposed on hauliers established in the host Member State, so as to prevent any discrimination on grounds of nationality or place of establishment. 1. In the event of serious disturbance of the national transport market in a given geographical area due to, or aggravated by, cabotage, any Member State may refer the matter to the Commission with a view to the adoption of safeguard measures and shall provide the Commission with the necessary information and notify it of the measures it intends to take as regards resident hauliers. ‘geographical area’ means an area covering all or part of the territory of a Member State or extending to all or part of the territory of other Member States. 3. The Commission shall examine the situation on the basis in particular of the relevant data and, after consulting the committee referred to in Article 15(1), shall decide within 1 month of receipt of the Member State’s request whether or not safeguard measures are necessary and shall adopt them if they are necessary. Measures adopted in accordance with this Article shall remain in force for a period not exceeding 6 months, renewable once within the same limits of validity. 4. If the Commission decides to adopt safeguard measures concerning one or more Member States, the competent authorities of the Member States involved shall be required to take measures of equivalent scope in respect of resident hauliers and shall inform the Commission thereof. Those measures shall be applied at the latest as from the same date as the safeguard measures adopted by the Commission. 5. Any Member State may refer to the Council a decision taken by the Commission pursuant to paragraph 3 within 30 days of its notification. The Council, acting by a qualified majority may, within 30 days of that referral, or, if there are referrals by several Member States, of the first referral, take a different decision. The limits of validity laid down in the third subparagraph of paragraph 3 shall apply to the Council’s decision. The competent authorities of the Member States concerned shall be required to take measures of equivalent scope in respect of resident hauliers, and shall inform the Commission thereof. If the Council takes no decision within the period referred to in the first subparagraph, the Commission decision shall become final. Member States shall assist one another in ensuring the application and monitoring of this Regulation. They shall exchange information via the national contact points established pursuant to Article 18 of Regulation (EC) No 1071/2009. temporary or permanent withdrawal of the Community licence. These penalties may be determined after the final decision on the matter has been taken and shall have regard to the seriousness of the infringement committed by the holder of the Community licence and to the total number of certified true copies of that licence that he holds in respect of international traffic. withdrawing, temporarily or permanently, the Community licence. These penalties may be determined after the final decision on the matter has been taken and shall have regard to the seriousness of the infringement committed by the holder of the Community licence. 3. The competent authorities of the Member State of establishment shall communicate to the competent authorities of the Member State in which the infringement was ascertained, as soon as possible and at the latest within 6 weeks of their final decision on the matter, which, if any, of the penalties provided for in paragraphs 1 and 2 have been imposed. If such penalties are not imposed, the competent authorities of the Member State of establishment shall state the reasons therefor. 4. The competent authorities shall ensure that the penalties imposed on the haulier concerned are, as a whole, proportionate to the infringement or infringements which gave rise to such penalties, taking into account any penalty for the same infringement imposed in the Member State in which the infringement was ascertained. 5. The competent authorities of the haulier’s Member State of establishment may also, pursuant to national law, bring proceedings against the haulier before a competent national court or tribunal. They shall inform the competent authority of the host Member State of any decisions taken to this effect. 6. Member States shall ensure that hauliers have the right to appeal against any administrative penalty imposed on them pursuant to this Article. the penalties imposed and the penalties executed. The competent authorities of the host Member State may request the competent authorities of the Member State of establishment to impose administrative penalties in accordance with Article 12. 2. Without prejudice to any criminal prosecution, the competent authorities of the host Member State shall be empowered to impose penalties on a non-resident haulier who has committed infringements of this Regulation or of national or Community road transport legislation in their territory during a cabotage operation. They shall impose such penalties on a non-discriminatory basis. These penalties may, inter alia, consist of a warning, or, in the event of a serious infringement, a temporary ban on cabotage operations on the territory of the host Member State where the infringement was committed. 3. Member States shall ensure that hauliers have the right to appeal against any administrative penalty imposed on them pursuant to this Article. Member States shall ensure that serious infringements of Community road transport legislation committed by hauliers established in their territory, which have led to the imposition of a penalty by any Member State, as well as any temporary or permanent withdrawal of the Community licence or of the certified true copy thereof, are recorded in the national electronic register of road transport undertakings. Entries in the register which concern a temporary or permanent withdrawal of a Community licence shall remain in the database for 2 years from the time of the expiry of the period of withdrawal, in the case of temporary withdrawal, or from the date of withdrawal, in the case of permanent withdrawal. 1. The Commission shall be assisted by the committee established by Article 18(1) of Regulation (EEC) No 3821/85. Member States shall lay down the rules on penalties applicable to infringements of the provisions of this Regulation, and shall take all the measures necessary to ensure that they are implemented. The penalties provided for must be effective, proportionate and dissuasive. Member States shall notify those provisions to the Commission by 4 December 2011, and shall notify it without delay of any subsequent amendment affecting them. Member States shall ensure that all such measures are taken without discrimination as to the nationality or place of establishment of the haulier. 1. Every 2 years Member States shall inform the Commission of the number of hauliers possessing Community licences on 31 December of the previous year and of the number of certified true copies corresponding to the vehicles in circulation at that date. 2. Member States shall also inform the Commission of the number of driver attestations issued in the previous calendar year as well as the number of driver attestations in circulation on 31 December of that same year. 3. The Commission shall draw up a report on the state of the Community road transport market by the end of 2013. The report shall contain an analysis of the market situation, including an evaluation of the effectiveness of controls and the evolution of employment conditions in the profession, as well as an assessment as to whether harmonisation of the rules in the fields, inter alia, of enforcement and road user charges, as well as social and safety legislation, has progressed to such an extent that the further opening of domestic road transport markets, including cabotage, could be envisaged. Regulations (EEC) No 881/92 and (EEC) No 3118/93 and Directive 2006/94/EC are hereby repealed. References to the repealed Regulations and Directive shall be construed as references to this Regulation and shall be read in accordance with the correlation table set out in Annex IV. It shall apply from 4 December 2011, with the exception of Articles 8 and 9, which shall apply from 14 May 2010. (1) OJ C 204, 9.8.2008, p. 31. (2) Opinion of the European Parliament of 21 May 2008 (not yet published in the Official Journal), Council Common Position of 9 January 2009 (OJ C 62 E, 17.3.2009, p. 46), Position of the European Parliament of 23 April 2009 (not yet published in the Official Journal) and Council Decision of 24 September 2009. (3) OJ L 95, 9.4.1992, p. 1. (4) OJ L 279, 12.11.1993, p. 1. (5) OJ L 374, 27.12.2006, p. 5. (6) OJ L 102, 11.4.2006, p. 1. (7) OJ L 368, 17.12.1992, p. 38. (8) OJ L 18, 21.1.1997, p. 1. (9) OJ L 370, 31.12.1985, p. 8. (10) See page 51 of this Official Journal. (12) OJ L 33, 4.2.2006, p. 82. (13) OJ L 16, 23.1.2004, p. 44. (14) OJ L 235, 17.9.1996, p. 59.
a security design background with fine guilloche patterns and rainbow printing. This licence is issued under Regulation (EC) No 1072/2009. In the case of carriage from a Member State to a third country or vice versa, this licence is valid for that part of the journey carried out within the territory of the Community. It shall be valid in the Member State of loading or unloading only after the conclusion of the necessary agreement between the Community and the third country in question in accordance with Regulation (EC) No 1072/2009. The licence is personal to the holder and is non-transferable. supplied incorrect information with regard to the data needed for the issue or extension of the licence. The original of the licence must be kept by the haulage undertaking. A certified copy of the licence must be kept in the vehicle (1). In the case of a coupled combination of vehicles it must accompany the motor vehicle. It covers the coupled combination of vehicles even if the trailer or semi-trailer is not registered or authorised to use the roads in the name of the licence holder or if it is registered or authorised to use the roads in another State. The licence must be presented at the request of any authorised inspecting officer. Within the territory of each Member State, the holder must comply with the laws, regulations and administrative provisions in force in that State, in particular with regard to transport and traffic. (1) ‘Vehicle’ means a motor vehicle registered in a Member State, or a coupled combination of vehicles the motor vehicle of which at least is registered in a Member State, used exclusively for the carriage of goods. This attestation is issued under Regulation (EC) No 1072/2009. It certifies that the driver named therein is employed, in accordance with the laws, regulations or administrative provisions and, as appropriate, the collective agreements, in accordance with the rules applicable in the Member State mentioned on the attestation, on the conditions of employment and of vocational training of drivers applicable in that Member State to carry out road operations in that State. The driver attestation shall belong to the haulier, who puts it at the disposal of the driver designated therein when that driver drives a vehicle (1) engaged in carriage using a Community licence issued to that haulier. The driver attestation is not transferable. The driver attestation shall be valid only as long as the conditions under which it was issued are still satisfied and must be returned immediately by the haulier to the issuing authorities if these conditions are no longer met. supplied incorrect information with regard to the data needed for the issue or extension of the attestation. A certified true copy of the attestation must be kept by the haulage undertaking. An original attestation must be kept in the vehicle and must be presented by the driver at the request of any authorised inspecting officer.